A storm is coming. The first storm during this autumn. It rips through the grass and over the land and roars mightily, like a lion, while it cleans up the remaining parts of summer. All the heat dust flies away, burning in the eyes one last time like sand, and is finally gone. I cannot await to face up to the wild nature, wrap myself up in warm clothes and go outside, right under the free sky. I confront the storm, throw my arms into the air and let the wind embrace me. Now we both are trying to outdo each other in roaring out of joy for the wuthering life. Soon the storm will calm down and leave the world in a chaotic but natural order. A world, that has finally said its goodbye to this year’s summer and has devoted itself to autumn instead. 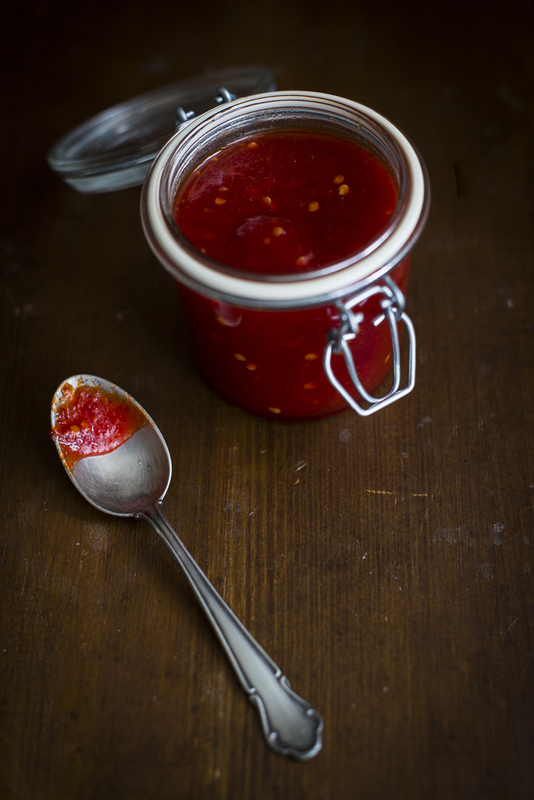 And to start into the cooler part of the year I will cook myself a jar of chili sauce. Because with its refreshing acidity, comforting-mild sweetness and warming hotness it is exactly what we will need in the next months. Uncomplicated. Red like the last days of summer. Delicious! Wash the chilis, cut off the green part and halfen them lengthwise. Scrape off the seeds and keep them for later. Roughly chop the chills, put them in a blender and add about the half of the vinegar. Blend it finely, then pour the mixture in a pot. Add the rest of the vinegar, the sugar, the salt and the seeds from before (as much of them as you like) and bring everything to a boil. Turn down the heat to medium and let it bubble gently for about 30-45 minutes until the sauce has thickened (almost like ketchup). 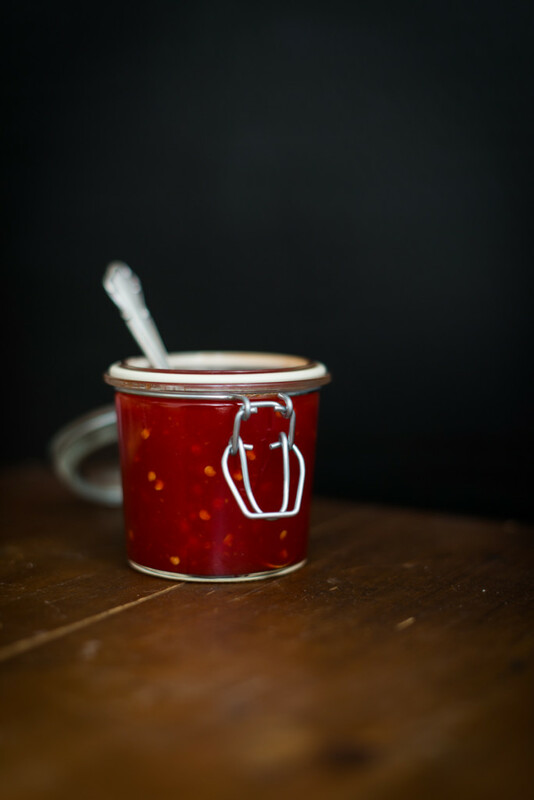 While still hot fill it in sterilized jars or bottles, close them tightly and use the sauce up in the next 6 months. 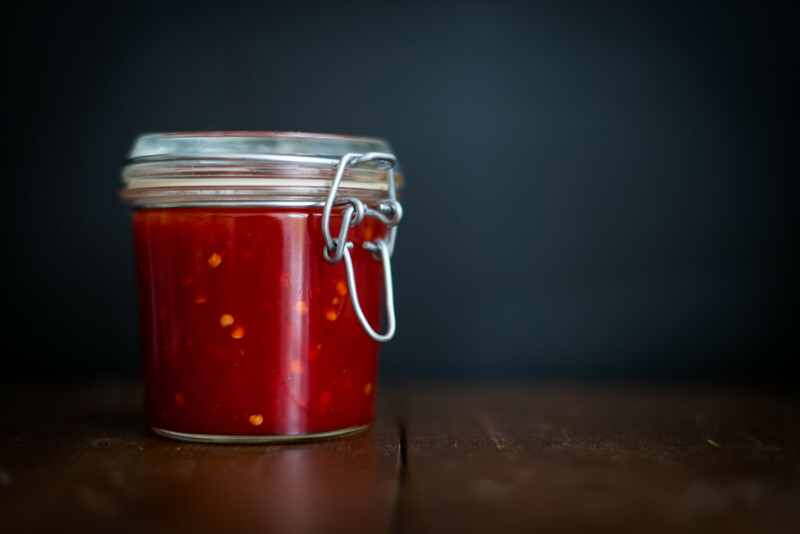 *How hot the sauce will actually become depends on the chilis you use. For a prettier look I removed the seeds before blending the chills and added them later to the sauce. You can just add parts of the seeds and reduce the pungency with that as well or leave the seeds out all together. But keep in mind that already the types of chilis vary in how hot they are. If your skin had too much contact with hot chilis during preparation and your hands start to feel like they are on fire it really helps to use curd cheese packings: Wet a clean kitchen towel and generously apply a layer of curd cheese – the more fat it contents the better. Wrap the cloth (with the curd-cheese side on your skin) around your hands. It cools, calms and pulls away the hot acidity.